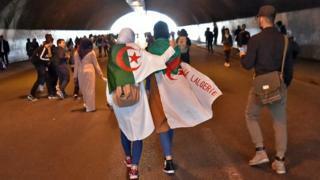 Tens of thousands of people are marching in the Algerian capital, Algiers, in a massive protest against President Abdelaziz Bouteflika. The demonstrations – now in their third week – were triggered by the ailing president’s decision to seek re-election for a fifth term in April. Mr Bouteflika has ruled Algeria for 20 years but has rarely been seen in public since he had a stroke in 2013. He has warned that the protests could plunge the country into “chaos”. In a letter published by Algeria’s official APS news agency on Thursday, the 82-year-old leader urged “vigilance” against “domestic and foreign” forces that might infiltrate the demonstrations. But he also praised the demonstrators for “peacefully expressing their opinions”. The protest on Friday is thought to be the largest yet in a series of demonstrations that began three weeks ago. The privately owned Arabic-language news website, El Khabar, quoted the public transport body for Algiers as saying that all bus, tram, train and metro services had been suspended ahead of the rally. According to French broadcaster LCI, anti-riot vehicles, including a water cannon, have been deployed in the city centre. Demonstrations have been held in towns and cities across the country following the announcement last month that Mr Bouteflika would seek a fifth term in office. Mr Bouteflika later released another letter saying that he would step down early if re-elected – but this has not quieted the protests. The president was transferred to a hospital in Switzerland on 24 February, for what his campaign described as “routine” medical tests. His campaign manager told El Khabar on Thursday that his health raised “no concerns”. A spokesman for the Geneva University Hospitals (HUG), where Mr Bouteflika is staying, has been quoted as saying that it had received 1,500 phone calls on Tuesday after the president’s location was revealed by French television programme Quotidien. While most of the calls have reportedly been enquiring about the president’s health, a number of videos posted to social media show prank calls from Algerians.